Does the Electronic Gold Fix Matter? New technologies bring new changes to our world. One small change just happened in the financial world, although it is not on most people’s radar. The old gold fix – which was a conference call that took place twice a day – has been replaced by a new electronic gold fix. 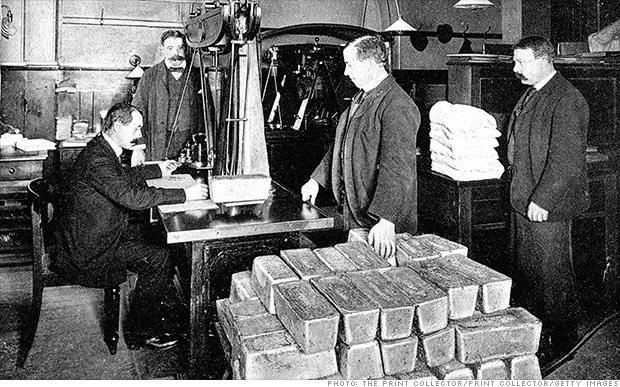 The old gold fix was a century old and consisted of four banks – Barclays, HSBC, Bank of Nova Scotia, and Societe Generale. These four banks will remain a part of the new process, plus two additional participants. The new gold fix will be an electronic benchmark, utilizing 21st century technology. It is hoped that it will come with more transparency and less vulnerability to rigging of the markets. This all comes about after allegations of rigging in various financial markets including interest rates, foreign exchanges, and precious metals. In other words, the problem with the old gold fix is that supposedly there was price fixing with gold. This makes perfect sense in a world of government-regulated financial markets. While the gold fix was designed for settling contracts, it has often been used as a benchmark for pricing gold products in world markets. It’s always hard to say whether certain markets were rigged. The problem is the lack of transparency, so you don’t really know what’s going on anyway. This new process may or may not be more transparent, but it probably won’t be any worse. I have never gotten too excited over allegations of price fixing. In something as big as the gold market, tampering of the benchmark rate will probably only mean small differences in prices, and even those would be short term. In other words, if you are an average investor and just buying a few gold coins or a few thousand dollars worth of investments that represent gold, then this probably won’t affect you much, especially if you’re not getting in and out of the market quickly. If you are buying gold today to hold it for several years, then small price differences aren’t going to make much of a difference to you. In terms of allocating resources, price discovery is very important. The more transparency, the better it is. The bigger the market, the better it is. Futures markets also play a vital role in allocating resources. Accurate price discoveries are important for supply and demand. It’s hard for people to conceive of this when discussing something like gold, or even stocks. I find it’s easier to conceptualize with something such as oil. If the futures market starts showing a higher price for oil into the distant future, then it will change behavior today. Suppliers may start to withhold supplies today. They may also start investing more capital for future supplies. Of course, the cause and effect work the other way too, as changes in conditions today will change future prices. Any changes in the price of oil, either today or in the futures market, will affect how suppliers act and also current consumption. It is the best way we have for allocating scarce resources. Open price discovery makes for smoother markets. It leads to fewer shortages. It leads to less volatility in prices. This isn’t to say that other factors can’t lead to price volatility, such as central bank policy. This is why I’m not too concerned about price fixing allegations in the gold market, or in any other major market. We have a global economy with almost instantaneous financial markets. We have functioning futures markets where speculators are trying to make money. Their drive to make money allows the market to function more effectively, as it leads to better price discovery. The new electronic gold fix was inevitable, even if there had not been any known scandals in rigging market prices. The good news is that big banks and government regulators are playing less and less of a role in the financial markets. It isn’t due to a lack of trying. It’s just simply that we now live in a global economy and technology is on our side. How can government regulators compete with computer algorithms and high-speed computers? Any rigging of the markets is going to be corrected rather quickly by the millions of buyers and sellers in the marketplace. An electronic gold fix won’t really be fixing the prices at all. Gold prices are determined by supply and demand. Unfortunately, central bank policies of inflation still factors in to this equation. In the absence of a free market, gold smuggling is big business. Aluminum was a big topic in today's debut of the Apple Watch, and for good reason. The metal is as useful as it as affordable.